Members of Revere’s administration and members from the architectural and construction firms pose for groundbreaking. Building construction on the new high school, Bath School and training fields continues as the district progresses their timeline to completion. 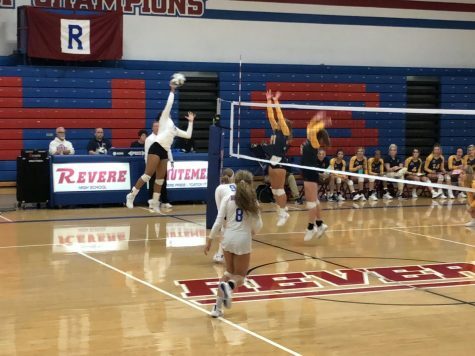 RHS Principal Phil King commented on some of the timeline changes, including the expedited construction of the practice field across the street, which was originally proposed as a temporary parking lot but added that the basic framework of the timeline as a whole is relatively the same. “The timeline for creating the softball field and the practice field that’s over across the street at the horse show property has changed. There’s no longer parking that’s needed over there, so now they’re just moving right forward with putting in the softball field and the practice field,” King said. King also commented on the numerous advantages that students will have in the new building, including new state-of-the-art collaboration spaces available in each wing on both the first and second floors. “[There] will be a pod area where there will be some general lounging seating where kids can have a little more collaboration space, and there will be some individual nooks . . . where there will be seating for about five or six people. . . it’ll be glass so you can see, but you can close the door and you’ll be able to talk about whatever instructional things you need to talk about. There will also be a larger area that will seat about 35 people. For a classroom project, a teacher can send kids out if they need and they can really use that space,” King said. King talked about other advantages students and teachers will have, including a more centrally located entryway that allows for easier access. King also commented on the new locker configurations for students, as well as the new air conditioning system in the building. “[When] you enter the building, you’ll be able to get to your areas quickly from where you’re dropped off. It’s more centrally located; you don’t have to walk from one end [of the building] all the way to the other. [The] lockers will [also] be one locker; [there] won’t be stacked lockers, so that will be an advantage. [In] the hot weather, we’ll have air conditioning throughout the building,” King said. Superintendent Matthew Montgomery talked about some of the minor changes in regards to the project, including turning the renderings and designs into conceptual design but also noted that no major alterations to any building plans or processes have taken place since the plans were unveiled to the community in February. “We have been fine-tuning the plans as we prepare for the conceptual design phase, so moving from schematic design to conceptual design, and those plans are due at the end of September from our architects to our construction firm,” Montgomery said. Montgomery also commented on the advantages students will have at the new high school, including a new state-of-the-art building design, updated classroom designs, and common spaces in each academic wing of the building that will provide extended learning activities. “There are numerous advantages. It’s going to be state-of-the-art design. . . . We will also have air conditioning throughout the whole building, a brand new state-of-the-art auditorium, state-of-the-art gymnasium and auxiliary gym, and a floor plan that really highlights what we have to offer, and [this] will make the student experience that much greater because of all of the work and the energy that have went into putting this together,” Montgomery said. 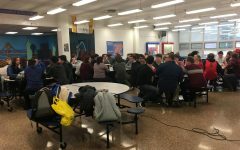 Montgomery also noted the changes currently occurring in the district and will occur over the next few years during the construction process that will impact life at the current building in terms of things such as parking when large events occur. “[The] biggest thing that will be impacted will be arrival and dismissal in terms of there is a flurry of construction activity that is now happening due to early site work taking place at both the horse show property, as well as the property adjacent to the existing high school where the new building will live. 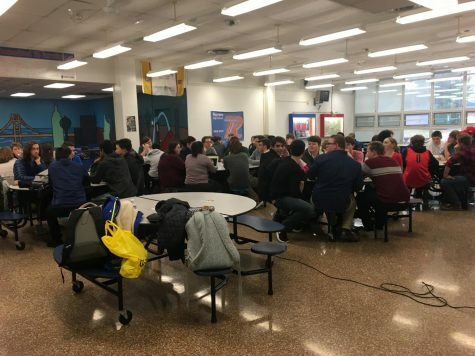 Additionally, there is an impact on when you have larger activities at the high school, or at Richfield [Elementary] or at the middle school for that matter because we have less of the amount of parking that we have had in the past, prior to construction commencing,” Montgomery said. Montgomery also discussed the changes and the progress on the other construction projects going on throughout the district, such as at the new Bath Elementary. “Bath Elementary is in full swing with the construction process. We are anticipating opening that building next fall prior to the start of the school year, [in] fall of 2019. We are working on underground plumbing and electrical, and the concrete pads for the lower level of the building are being poured, and steel will be delivered on-site the week of [September] 24th, and then we will start seeing that building just erupt out of the ground. We are hoping to have that under roof by wintertime,” Montgomery said. Montgomery also noted the updates going on at Richfield Elementary and at the middle school, as well as the timeline of the project for the new bus garage. “[The] secured entryways were completed over the summer for both Richfield and the middle school, and a handicapped accessible, ADA-compliant ramp was installed at Richfield in front of the building. [The] work [at] the horse show property has begun, which is where the practice field and the new softball field will live once the project is complete. There are many different projects that are happening simultaneously, and the bus garage property has not started yet. We expect to either begin earthwork later this Fall, or start that project in full force in the Spring of 2019, so those are the other things that are happening in the midst of this project,” Montgomery said. Assistant Principal Doug Faris also commented on the advantage of common spaces at the new high school. “Students will have the advantages of collaborative spaces and common areas,” Faris said. 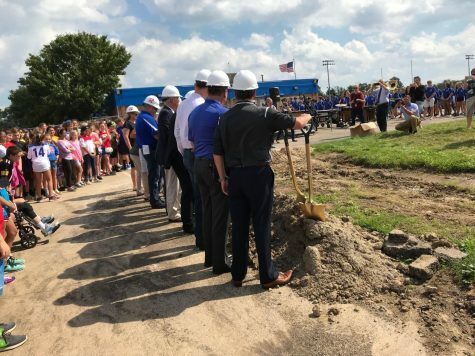 A groundbreaking ceremony was held on Friday, September 21st that was open to the public, and ground was officially broken on the new high school. The project is expected to move forward in full force in the coming weeks.